This was a great appetizer! 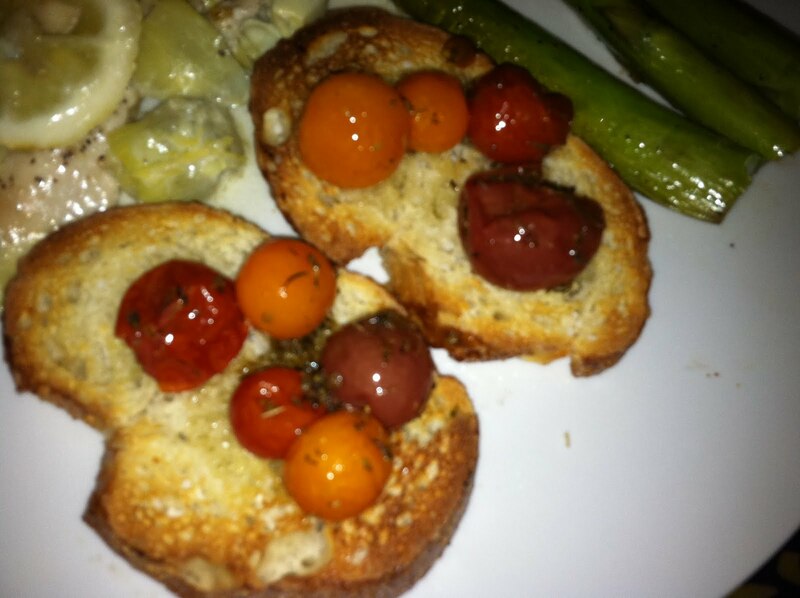 I don’t normally like cherry tomatoes, but the combination of sweet and salty was definitely tasty. Heat oven to 275. Place tomatoes on a baking sheet and pour half of the olive oil over them. Then, sprinkle oregano, pepper, and half of the salt over the tomatoes. Bake for about 40 minutes. Put tomatoes in a bowl for now and then place bread on baking sheet. Broil for about 4 minutes. Once the bread turns golden brown, take out and rub garlic on both sides of each. Drizzle olive oil and sprinkle salt over the bread. Place some tomatoes on each slice.